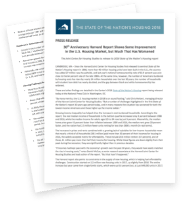 Since 1988, our annual State of the Nation’s Housing report has provided an overview of housing market conditions in the U.S. As we mark the 30th anniversary, this year’s report not only examines recent trends, but assesses whether and how key metrics have changed over the last three decades and serves as a yardstick to measure whether or not the nation has met its goal of producing decent and affordable homes for all. The inaugural State of the Nation’s Housing report in 1988 noted that the majority of Americans were well housed and some conditions have improved since then. More than 40 million units have been built over the past three decades, accommodating 27 million new households, replacing older homes, and improving the quality of the nation’s housing stock. Nevertheless, several challenges highlighted in the first report persist today. Homeownership rates among young adults are even lower than in 1988, and the share of cost-burdened renters is significantly higher, with almost half of all renters paying more than 30 percent of their income for housing. Soaring housing costs are largely to blame. The national median rent rose 20 percent faster than overall inflation between 1990 and 2016 and the median home price rose 41 percent faster. While better housing quality accounts for some of the increased costs, higher costs for building materials and labor, limited productivity gains, increased land costs, new regulatory barriers, and growing income inequality all played major roles as well. Nearly a third of U.S. households (38.1 million) paid more than 30% of their incomes for housing in 2016. More than half (20.8 million) are renters, and fully 80% of renters and 63% of owners making less than $30,000 are cost burdened. Increases in the median sales price of existing homes have outstripped growth in median household income for six straight years. The price of a typical existing home sold in 2017 was more than four times the median income. The number of renter households in the U.S. declined by more than 180,000 to 43.1 million in 2017. This was the first sign of slowing renter growth since 2004. Residential mobility continued its long-term decline in 2017. 11% of the U.S. population changed residences in 2017, the lowest mobility rate on record. The homeownership rate between black and white Americans is widening. Between 1994 and 2016, black homeownership rates increased just 0.3% while white rates rose 2.2%, widening the black-white gap to 29.2%. With its oldest members now in their late 20s and early 30s, millennials are forming new households in greater numbers and moving to different states in search of opportunity. At the same time, more than 10,000 baby boomers are turning 65 every day, raising the average age of US households. 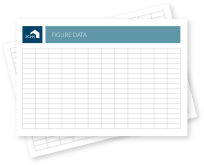 Although wealth is growing, homeowners and those at the top have captured most of the gains, leaving millions of households with little or no wealth. Going forward, immigration will become an increasingly large, albeit unpredictable, source of population growth and therefore housing demand. More than 38 million US households have housing cost burdens, leaving little income left to pay for food, healthcare, and other basic necessities. As it is, federal housing assistance reaches only a fraction of the large and growing number of low-income households in need. Between the shortage of subsidized housing and the ongoing losses of low-cost rentals through market forces, low-income households have increasingly few housing options. Meanwhile, the rising incidence and intensity of natural disasters pose new threats to the housing stocks of entire communities. The Harvard Joint Center for Housing Studies advances understanding of housing issues and informs policy. Through its research, education, and public outreach programs, the center helps leaders in government, business, and the civic sectors make decisions that effectively address the needs of cities and communities. Through graduate and executive courses, as well as fellowships and internship opportunities, the Joint Center also trains and inspires the next generation of housing leaders. To hear about new research and upcoming events, please sign up for our mailing lists (check all that you are interested in).